In recent years, left-of-center political activism among medical students has grabbed headlines across the country, including die-ins staged by the racial health justice group White Coats for Black Lives, and student-led ACA sign-up drives and gun-control demonstrations. 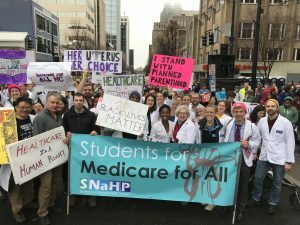 If SNaHP’s recent growth (the group’s numbers are up 50 percent since 2016) is any indication, today’s students are poised to find themselves on the front lines of a protracted political battle over the future of a profit-driven health-care system that many of them intend to dismantle and fix from within. It hasn’t always been this way: Medical school curricula can be notoriously divorced from the broader social and political context that shapes the lives of students’ future patients. Instructors often maintain an expressly apolitical posture toward political issues, and practicing physicians are encouraged to do the same; as Dr. Thomas S. Huddle put it in the journal Academic Medicine in 2011, “Advocacy on behalf of societal goals, even those goals as unexceptionable as the betterment of human health, is inevitably political. … Official efforts on behalf of advocacy will undermine university aspirations to objectivity and neutrality.” As I reported this story, a few dozen current and former medical students told me they’d received only minimal exposure in classrooms to material about health-care financing in general, let alone about single-payer specifically. Augie Lindmark, a third-year at the University of Minnesota and a SNaHP board member, tells me that, as for most students, his introduction to these ideas was extracurricular. It wasn’t until attending a talk by Dr. Steffie Woolhandler, the co-founder of PNHP (Physicians for a National Health Program, of which SNaHP is the student arm), that he came to appreciate fully the dire state of health-care financing in the United States. This confrontational posture places these left-leaning students at odds with many of their historical predecessors, who have often prioritized professional and financial interests over reforming health-care financing. During the administration of President Harry Truman, the American Medical Association famously beat back a once-popular proposal for national health insurance by launching what was then the biggest lobbying campaign in American history. The AMA smeared the public plan as “socialized medicine,” and the organization’s successful campaign against Truman helped entrench the private, employer-based system that we’re still stuck with today. Just over a decade later, the AMA allied with industry representatives to try to defeat Medicare and Medicaid—only to pivot, enthusiastically, once it became clear just how conciliatory legislators intended to be in carving out lucrative roles for the private sector. While the AMA (and physicians more broadly) have been more supportive of reforms in the decades since, their endorsements have largely come with caveats to protect their autonomy and, above all, their salaries. This year, SNaHP led an effort within the AMA’s student wing to encourage the group to endorse Medicare for All. It isn’t terribly hard to figure out why many U.S. physicians would resist transformative health financing reform, even if Medicare did end up being more of a cash cow than their propaganda in the 1960s had warned. For many decades, doctors were among the parties who derived the greatest advantages from commodified health care. The structural shortcomings of a piecemeal, for-profit system leave insurers unable to negotiate prices effectively, resulting in staggering medical cost inflation that has tended to benefit physicians. By covering all Americans in one unified insurance pool, single-payer systems—like those envisioned in bills sponsored by Sanders and Ellison—would leverage federal bargaining power to drive down reimbursements paid to providers. In peer countries that employ similar health-care cost controls, doctors earn some 40 percent less than their American counterparts—and, as Elizabeth Rosenthal notes in her book An American Sickness: How Healthcare Became Big Business and How You Can Take It Back, while most Americans have struggled to make do amid lackluster job prospects since 2009, doctors’ pay has risen steadily. And, given that the average U.S. medical student graduates with $170,000 in debt, there are strong incentives to protect the status quo even before becoming a part of it. But there is evidence that this self-interest among doctors is changing too. Polls show that 56 percent of American doctors now support a single-payer health system, up from 42 percent in 2008. That shift may partly reflect the recent erosion of the traditional advantages that doctors long held within the system. Rampant industry consolidation has left more than 50 percent of doctors working for larger corporate entities, rather than owning their own practice, and physicians can expect to spend over twice the amount of time on the complicated administrative work our system demands than they’re able to spend with patients. And, of course, doctors see firsthand the harm that inadequate insurance coverage has done to their patients: Tens of thousands of Americans die each year because they don’t have insurance, even after the reforms of Obamacare. “I’m banging my head against the wall every day just trying to get my patients the care they need in this broken system,” explains Dr. Richard Bruno, a family physician who co-founded SNaHP as a med student in 2011. The failures of that system can have grave effects on doctors themselves, among whom suicide rates are on the rise. Their anguish, many argue, is ascribable to the very system harming so many of their patients: “Doctors are just trying to survive day to day … they’re victims of the system too,” Bruno says. Bruno is heartened by SNaHP’s growth: “I’ve never seen a more active group in all the orgs I work with…. While they’re learning how to stop disease, they’re spreading their passion for health justice; it’s beautiful, really,” he says. Students do have a historic track record in helping to advance progressive movements: They can have the advantage of being able to shape institutions as they move through them, establishing new political norms from the get-go that stretch the boundaries of currently acceptable discourse within the profession. And given the AMA’s politically decisive role in knocking down a single-payer plan during Truman’s presidency, and the group’s critical roles in the health-care system overall, doctor buy-in will be essential to achieve Medicare for All. While the organization endorsed the ACA in 2009, it still maintains an official stance against single-payer—a decades-long position that Lindmark says SNaHP is pushing them to reject this summer. 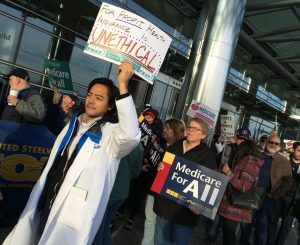 At the American Medical Association’s annual conference in June, medical students demanded the organization end its decades-long opposition to a single-payer national health program, a system that would be publicly financed but privately delivered and is better known as “Medicare for All.” This week, members of the Student Osteopathic Medical Association will submit a resolution asking the American Osteopathic Association to support Medicare for All. Currently, the majority of Americans and practicing physicians support single-payer health care. 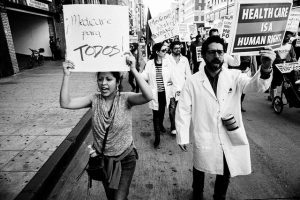 In their resolutions, medical students from both organizations acknowledge what the rest of the country already knows: Market-driven healthcare is leading Americans to early graves and medical bankruptcy. Our health system produces some of the worst health outcomes in the industrialized world—the U.S. has the highest rate of infant mortality and the highest number of avoidable deaths—and devours an ever-increasing share of our economy with health spending accounting for a whopping 17.9 percent of the GDP. Those fortunate enough to have insurance face prohibitively expensive copays, premiums, and deductibles that limit access to care, and medical expenses remain a leading cause of bankruptcy. Instead, Medicare for All would give health care providers more autonomy because their clinical judgement—not the financial bottom line of insurance companies—will guide patient care. Patients would have free choice of any doctor, allowing providers to compete based on quality of care. Physicians would spend less time on administrative responsibilities like paperwork and billing, and more time seeing patients, which boosts both their work satisfaction and income. We proudly stand alongside America’s future physicians in their efforts to steer the AMA and the AOA towards a universal, single-payer health system that provides quality, equitable care for all patients. 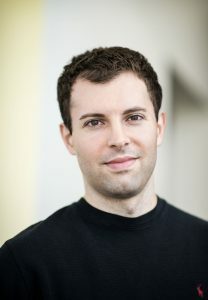 Karim Sariahmed is a medical student at the Lewis Katz School of Medicine at Temple University. In addition to supporting the growth of Temple Med’s SNaHP chapter, he is a member of Put People First! PA. This is the community in Philadelphia that teaches him how to organize alongside many other developing organizers from various healthcare professions and healing traditions. You can read his other work at in-Training and the PPF-PA blog. He tweets @sariahmed. 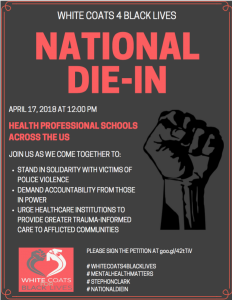 ACTION ALERT: #MEDforED:Healthcare solidarity with NC teachers! Together, as members of professions whose goal is to foster, care for, and promote the health of our communities, we condemn this endless attack on North Carolina educators. Teachers are fighting for the future of our children. With our common values, it is our obligation to support them in the classroom and in the public square. The North Carolina teachers’ rally is an opportunity for us to show our support for public education, clarify that we offer an answer to the healthcare crisis, and emphasize the connection that Improved Medicare-for-All should have in a larger movement for social justice. Wear your white coat at the march and rally on Wednesday, May 16 in Raleigh. Healthcare workers and single-payer advocates will assemble between 10:00 and 10:30am at 700 S. Salisbury Street in Raleigh, North Carolina. The march to the Legislative Building will begin at 10:30. Share and like the Facebook event. Post on social media using #MEDforED and pledge your support for NC teachers. Tell people about Improved Medicare-for-All! Rarely do we have a tangible answer for such a widespread, systemic problem like our current healthcare crisis. The good news is that we have several pieces of legislation that can fix our collective heartache: House Bill 676 and Senate Bill 1804 both expand Medicare for all Americans. Based on this proud tradition of student-led activism, we recently gathered in New Orleans with more than 100 fellow medical students from across the country for the annual summit of Students for a National Health Program (SNaHP). 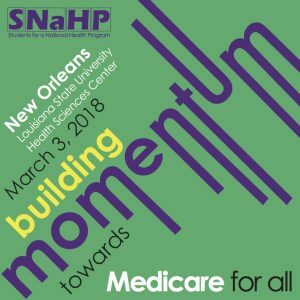 SNaHP is a national organization of medical and health professional students advocating for a single-payer, Medicare-for-all health system. The event was organized and led by passionate students who believe every patient deserves access to quality, affordable health care. 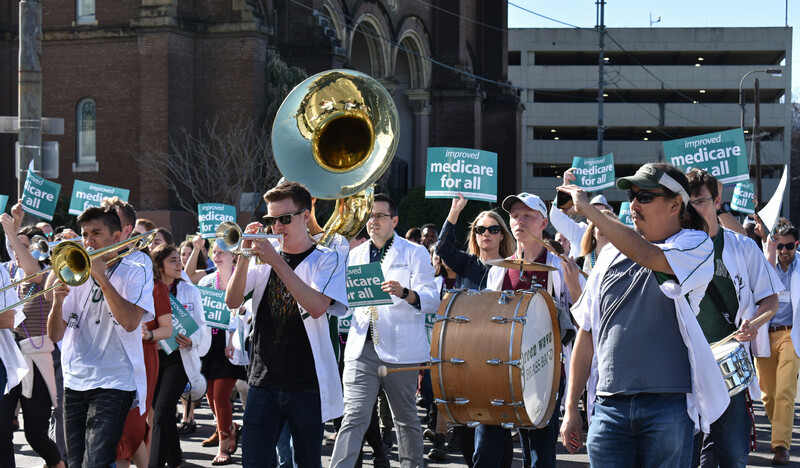 Wearing our white coats and holding “Medicare for All” signs, we danced and marched in a second line parade for health justice, crossing paths with University Medical Center and Tulane Medical Center. The day concluded with a keynote presentation by Bethany Bultman, CEO of the New Orleans Musicians’ Clinic, who explained how the majority of performance artists in New Orleans are uninsured and rely on the Musicians’ Clinic to access basic health services. Musicians are at the heart of the city’s culture, but fall through the cracks of our fractured health system — often earning too much money to qualify for Medicaid, but not enough to afford private insurance. Musicians aren’t the only New Orleanians who experience health care rationing. 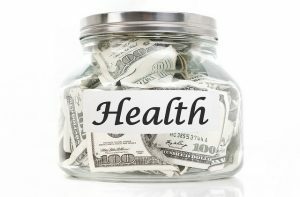 According to data from the U.S. Census Bureau, approximately 54,417 people in New Orleans still do not have any form of health insurance. Our medical education can only benefit our future patients if an insurance company deems they are worthy of care. While we are taught to see all patients as humans deserving of the highest quality care, private insurers see patients as nothing but profit. We will not stand for a system that prevents us from providing the care our patients need. In this historic political moment of student-led activism, our time is now. Your health is too important for it not to be. It is our duty as future health professionals to use our platform to amplify the voice of our community. We cannot keep ignoring the institutional racism upon which our nation was founded and which persists up to this day. We cannot overlook the racial disparities present in communities of color. We will not remain silent as communities become unhinged by continued violence and persecution. These injustices affect communities at large and increase physical and mental illness burdens in these communities. We have to do more. Our demands are clear. We stand in solidarity with all the victims of police violence. We demand justice for the victims and police accountability. We urge our own healthcare institutions to increase mental health resources and provide trauma-informed care to afflicted communities. If you agree with our demands, please sign your name on our petition. If you would like to do a demonstration at your school, please register your school here. Our action guide should help make planning for this event easy and consistent. The google folder also includes our flyer, media advisory, fact sheet on structural racism, Op Ed guide, and press release (TBA). Please share our FB event page with all of your peers. For any questions, please contact wc4blucd@gmail.com. As the nation watches, let us stand firm with our community. The ACA reforms initiated by Democrats provided some patient protections and increased health access for 20 million Americans since it was implemented in 2010. Its primary mission, however, was to ensure that Americans would have to rely on the for-profit insurance market. Merely protecting the ACA would leave the most marginalized populations behind. Despite the ACA’s improvements, 28 million Americans remain uninsured, without access to primary care that could prevent costly and life-threatening diseases. Those fortunate enough to have insurance are assaulted by prohibitively expensive co-pays, premiums and deductibles that limit access to care. This past year we saw an upsurge in popular resistance against Republican attacks on important—if imperfect—social welfare initiatives, especially health care for the most vulnerable. Activists pushed back attempts to repeal and replace the ACA with bills that would lead to the loss of health coverage for at least 22 million Americans. As a premedical student and a health care worker, I bear witness to a broad spectrum of suffering; the kind that we are all likely to face at some point during our lives. But what haunts me at the end of each shift is the pain that could have have been prevented if patients who are uninsured or under-insured had been able to access care sooner. Take for instance the young woman who checked into the emergency room because she was uninsured and couldn’t afford the anti-inflammatory drugs that her doctor prescribed for her Crohn’s disease. Her symptoms worsened and when I x-rayed her, she was likely headed for invasive surgery. Based on my personal experiences working in health care, I believe that the prescription for our collective heartache is improved Medicare for all: An insurance system that is government-financed but privately delivered and could save the U.S. nearly $600 billion annually while providing all Americans with access to quality health care. Our health care system is once again at a crossroads. Here in North Carolina, the General Assembly refused to expand Medicaid under the ACA, denying thousands access to basic care. State Representative Donny Lambeth, a Republican, recently proposed House Bill 662, also known as Carolina Cares, that would finally expand Medicaid. However, as the Winston-Salem Journal reported earlier this month, some members of the General Assembly say that even if work requirements like those in Kentucky and Indiana are put into place, they won’t support providing health care to the state’s neediest citizens. Meanwhile, the majority of Americans are increasingly realizing what 100 years of struggle has taught Medicare-for-all supporters already know: any measure other than national health insurance will fail. Support for single payer is growing. According to the Pew Research Center, 60 percent of Americans believe that the federal government has a responsibility to provide health coverage to everyone. H.R. 676, the single-payer bill in the House, now has a record 120 co-sponsors; Sen. Bernie Sanders’ Medicare for All Act has 16 co-sponsors, including potential candidates for the presidential nomination. It’s true that in our time, just as in Lape’s era, embracing single payer demands not only a radical revision of how health care is financed but the courage to move beyond half-measures. Imagine a health care program that provides affordable, quality care to every person—ourselves, our families and our neighbors—regardless of age, income or employment; a model proven to work in every other developed nation. Isn’t that reason enough to take a leap? There are currently 61 SNaHP chapters in 28 states across the country. SNaHP, the student branch of Physicians for a National Health Program (PNHP), advocates for a comprehensive single-payer health program for America. Members of SNaHP assert that, “A single publicly funded, privately delivered universal healthcare system is necessary for us to provide high-quality care to all our patients.” Advocates point out that although the U.S spends over 17 percent of the GDP on healthcare, more than twice as much as any other industrialized nation, it underperforms in health indicators like life expectancy, infant mortality, and immunization. Furthermore, 33 million people in America are uninsured, which can make simple preventative measures that could deter costly chronic illness and life-threatening diseases inaccessible until it is too late. Additionally, for-profit health insurance companies make necessary healthcare prohibitively expensive even for many insured Americans. SNaHP members believe a single payer system is the most efficient solution to providing quality healthcare to all U.S. citizens. On paper, it would save $400 billion a year. It would also improve and extend the quality of life of Americans, reduce hospital visits, and enable people to continue working and contributing to the economy. Second-year medical student and chapter president, Justin Mckone, founded the LSU chapter of SNaHP in 2017. There are currently 68 LSUHSC students interested in SNaHP, including students from the medical, nursing, and public health schools. In March of 2017, four members traveled to Lewis Katz School of Medicine at Temple University in Philadelphia, PA, to attend the 6th annual SNaHP Summit. Over 170 students attended. LSU students were able to collaborate with nursing, physician’s assistant, nurse practitioner, social work, and medical students from all over the country. There was a panel discussion, breakout sessions on topics like “Legislative Advocacy at the Nexus of Primary Care and Public Health”, planning for chapters organized by region, and a keynote presentation on healthcare justice by Nijmie Dzurinko. Ashley Duhon, second-year medical student, and SNaHP Secretary, attended the 2017 Summit and looks forward to welcoming students to New Orleans for the 2018 Summit. “The SNaHP Summit last year was a great tool for broadening my knowledge base about the nitty-gritty details of ‘Medicare for All’ and about how to get involved with advocacy for an issue I care so deeply about,” Duhon said. 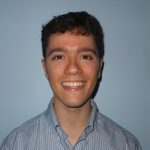 “I am excited for this year’s conference because this will be a valuable time to work on an action plan for our organization for ways to continue advocating to our Congressmen and educating our fellow medical students on why Medicare for All is the best possible healthcare system for our patients. In addition, I believe this will be a great opportunity for medical students around the country to see the rebuilding and growth that our healthcare system here in New Orleans has experienced since Hurricane Katrina”. In July, the SNaHP national board asked if the LSU SNaHP chapter would be interested in hosting the 2018 Summit. The LSU chapter met with school administrators, and drafted a proposal for the cost of renting space and personnel at LSU. The SNaHP board accepted the proposal. Any student from any school can register for the conference. Registration is $30 for conference admission only, and $80 for conference admission and housing for the weekend. Students can visit www.student.pnhp.org to register for the summit. 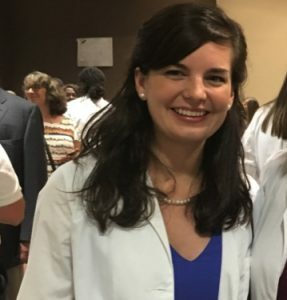 Claire Mickey is a medical student at Louisiana State University School of Medicine in New Orleans, Louisiana. She is the LSU SNaHP chapter VP of Education.